Lance Martinez from My Detroit Sports sends along this original photo of Minnesota Timberwolves point guard Ricky Rubio signing autographs at The Palace of Auburn Hills. 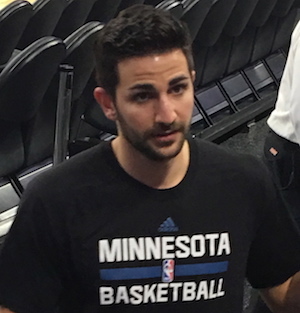 Rubio found himself in the news, during the recent period leading up to the February 23 trade deadline, amid rumors that he was about to be sent to the Knicks, in exchange for Derrick Rose. The deal never came to fruition, so Rubio remains in Minnesota, at least until the offseason. Now in his sixth season, Rubio is averaging career lows in points (9.1) and rebounds (3.9), while sitting fifth in the NBA with 8.6 assists. For his career, the Spaniard has averaged 10.0 points, 8.4 assists, 4.2 rebounds and 2.2 steals per contest. Rubio followers can view numerous examples of the flashy passers ongoing class with fans, via this link.